The new RDA cataloging standard offers libraries an unprecedented wealth of configurable data, but converting existing MARC records is unwieldy and time consuming. If a library has 50,000 titles, and if it takes five minutes for a cataloger to convert one MARC record to RDA, the entire conversion process will take more than 4,160 hours. That’s two full years of 40-hour workweeks! RDAExpress handles the task quickly, automatically, and efficiently, saving your library thousands of staff hours and greatly minimizing the impact on its already strained budget. Update your entire catalog or a single collection. Results delivered in 48 hours or less. Most “free” RDA conversion services convert only a few fields — in particular, the 336, 337, and 338 fields. RDAExpress adds up to 20 fields, dependent on format. RDA standards that provide controlled terms for information previously found only in fixed and notes fields. 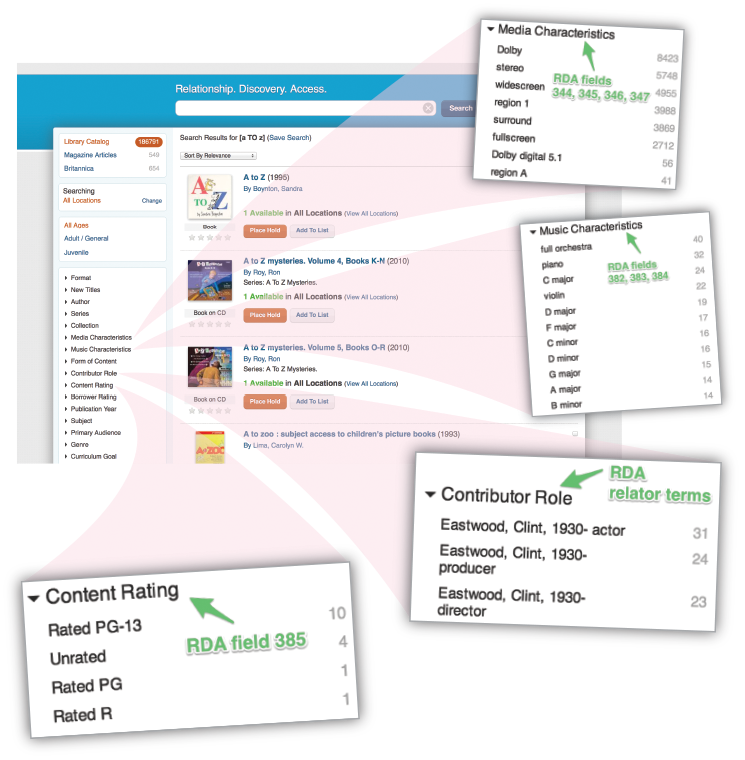 RDAExpress inputs these controlled terms in the “characteristics fields” (34x, 38x), enhancing consistency for search and discovery in library catalogs. RDAExpress adds additional enriched content such as MPAA ratings and video game ratings. RDAExpress adds relator terms to name fields for greater discovery. You won’t believe how easy it is to unleash your catalog’s full potential with RDAExpress. Try it for yourself! Visit RDAExpress.com today to register. You will receive a Terms & Conditions document that must be read, signed, and returned before conversions can begin. Registration is free and you only pay for the records you convert.